Curls, curls, curls! They're dangerous! Haha! When I was a child, I had a really perfect straight hair. I was even offered a Rejoice commercial while I was walking at the mall with my mom, but since my school doesn't allow such activities, we declined. I was 7 years old when that happened. I don't know what happened but probably my hair got mad for refusing its opportunity to shine because when I was 8, my hair started to become curly. HAHAHAHA! My mom has a really curly hair so it's not surprising (but why did it only come out after declining the offer? wahahhaha!) Anyway, when I entered highschool, I started rebonding my hair and for 8 years (yep, until college), I went on with the routine since you know how weird the look becomes after the original hair grows again and you have this perfect straight hair after the original part. I didn't want to do that anymore and decided to end the cycle by having my rebonded hair permed so that when the original part of my hair grows, everything's balanced already--I'm completely curly. And oh yeah, curls are no longer discriminated these days. "hey steph! blog something about hair products. i'm finding it hard to tame my curly hair huhu. anyway, if i may ask, what do you use pala? do you also blow-dry it or something? I was able to use FINESSE back then too! 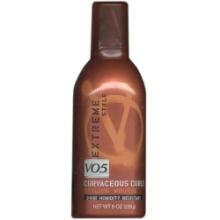 I also like VO5 Extreme Mousse Curvaceous Curls, so you might want to try that one out too if you're not satisfied with Finesse. What I usually do is after taking a bath, I comb my hair using my fingers so that they're not all tangly (I don't use brushes or combs). 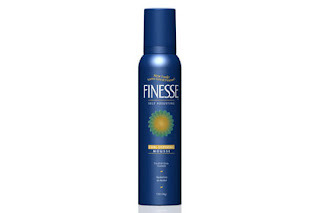 I towel dry it and add the mousse all throughout my hair right away. I just let my hair dry that way and tadahhhh, neat curls. Hehe. In your case, since your straight hair's growing already, I suggest that when you're putting the mousse, do scrunching motions. i agree girl,, ang ganda nga ng curls mo, i saw your pics sa bloggers meet up nio. deymmm! here again Imma give my comment a try darn this laptop lol! like you, my hair started out as straight and got curly and curlier as I grow older. =)) I had it chemically straightened twice and now I only use an iron (CHI) to straighten it. and if I may add few suggestions: after taking a bath and I decide on just leaving it as it is, I, too don't brush or comb it, nor towel dry my hair. Why?my hair gets caught sometimes in the towel & I hear them break/snap. so what I do is I just wrap it around loosely for a bit just until the towel absorbed the wetness of my hair. That's my problem too. I have been rebonding my hair for years :( I am wearing my worse crowning glory whenever my hair grows. Will try to use those :) Thanks! this blog applies for girls but i want to comment kasi i wanted a curly hair kasi since childhood hangang ngayon may hair is straight sobrang bagsak. kung pwede nga lang mag pakulot. ang kulot gusto ng straight ang straight hair gusto ng kulot. solosyon. magpakalbo. i always wanted to have my hair curled. hindi daw bagay. hihi. Do you hair any tips for uncontrollable thin hair? Mine is not straight, it's sort of wavy and it goes whenever it wants to LOL really cute post! will definitely try that product! mam/sir is this product are for men to? cause i want a curly hair ? is this products are for men to?? ?